Paracas National Reserve is a protected area located in the region of Ica, Peru and protects desert and marine ecosystems for their conservation and sustainable use. There are also archaeological remains of the Paracas culture inside the reserve. Sacasemita beach, at Paracas National Reserve. The reserve is located in the region of Ica, and spans an area of 335000 hectares, 65% of which correspond to marine ecosystems. The highest elevation in the reserve is 786 m. The reserve includes coastal geographic features such as: the Paracas Peninsula, Independencia Bay, San Gallán Island, Paracas Bay and Independencia Island. Paracas National Reserve is an arid zone, with intense local winds known as paracas. Precipitation is scarce and occurs in winter, falling mostly on the top of the highest hills, which is vital to the lomas ecosystem. The following climograph corresponds to the nearby town of Pisco (19 m of elevation). Some terrestrial plant species found in the reserve are: Tiquilia paronychoides, Prosopis pallida, Distichlis spicata, Tillandsia spp., Eriosyce omasensis, Geoffroea decorticans, Sesuvium portulacastrum, Cressa truxillensis, Geranium limae, Suaeda foliosa, Oxalis carnosa, etc. Algae found in the reserve include: Ulva lactuca, Chondracanthus chamissoi, Macrocystis pyrifera, Pyropia columbina, etc. Mammals found in the reserve include: the sei whale, the South American fur seal, the dusky dolphin, the marine otter, the sperm whale, the humpback whale, the South American sea lion, the killer whale, the common bottlenose dolphin, the southern right whale, etc. Birds found in the reserve include: the Andean condor, the Chilean flamingo, the spotted sandpiper, the oasis hummingbird, the Peruvian pelican, the Inca tern, the black skimmer, the Humboldt penguin, the guanay cormorant, the Peruvian thick-knee, the Andean swift, the Peruvian diving petrel, etc. Molluscs found in the area include: Argopecten purpuratus, Concholepas concholepas, Thais chocolata, Fissurella maxima, Glaucus atlanticus, Choromytilus chorus, Aulacomya atra, etc. Fish found in the reserve include: the Peruvian hake, the flathead grey mullet, the skipjack tuna, the blue flyingfish, the humpback smooth-hound, the copper shark, the Peruvian anchoveta, the eastern Pacific bonito, the Peruvian eagle ray, the fine flounder, the blue shark, the corvina, the bigeye tuna, etc. There are 65 archaological sites identified inside the reserve, many of them of the Paracas culture, known for their textile crafts. Beach tourism and wildlife observation are the main activities in the reserve. Red beach at Paracas National Reserve. Paracas National Reserve is located 250 km south of Lima, and 20 kilometers from the town of Pisco. Peruvian pelicans, at Paracas National Reserve. ^ "Paracas". Ramsar Sites Information Service. Retrieved 25 April 2018. ^ a b c d e f g h "De Paracas - Servicio Nacional de Áreas Naturales Protegidas por el Estado". www.sernanp.gob.pe (in Spanish). Retrieved 2018-11-09. 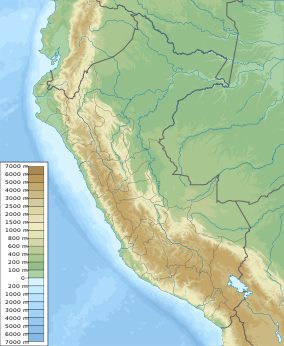 ^ a b "Paracas National Reserve - Park Profile - Geography". www.parkswatch.org. Retrieved 2018-11-11. ^ a b c d e f g Plan Maestro - Reserva Nacional de Paracas 2003-2007 (in Spanish). SERNANP. 2002. pp. 43, 164–165, 179–180. ^ a b Johnston, Ivan M. (1931). "THE VASCULAR FLORA OF THE GUANO ISLANDS OF PERU". Contributions from the Gray Herbarium of Harvard University (95): 26–35. JSTOR 41764132. ^ "Pisco climate: Average Temperature, weather by month, Pisco weather averages - Climate-Data.org". en.climate-data.org. Retrieved 2018-11-10. ^ a b c "Paracas National Reserve - Park Profile - Biodiversity". www.parkswatch.org. Retrieved 2018-11-10. ^ Paracas National Reserve: 40 years (in Spanish and English). SERNANP. 2015. p. 111. ^ Ramírez, M. E.; Santelices, B. (1991). "Catalogo de las algas marinas bentonicas de la costa temperada del Pacifico de Sudamerica". Monografias Biologicas (in Spanish). 5: 1–437. ^ "Pyropia columbina (Montagne) W.A.Nelson :: Algaebase". www.algaebase.org. Retrieved 2018-11-10.